The Proximity class constructs an object that represents a single Proximity sensor. Likely supports the entire LV-MaxSonar-EZ* line, additional sensors to be confirmed. Requires addition of another board such as an Arduino Nano to provide the I2C support. * For Arduino boards, it is absolutely REQUIRED to flash your board with a special version of StandardFirmata (PingFirmata). Instructions are here. Alternatively also consider an I2C Backpack which will keep your firmata the same and allow you to use this sensor on alternative boards such as a Raspberry Pi, BeagleBone or other non-Arduino board. The I2C backpack requires using an Arduino (eg Nano or pro-mini) to provide the I2C capability. This removes the blocking behaviour of the PingFirmata firmware and makes this sensor more portable across alternative boards (anything that has I2C support in its IO plugin). See NodeBots Interchange HC-SR04 module for more details. change The "change" event is fired when the distance to obstruction reading changes within the observable range of the sensor. The above listed devices require a special version of Firmata (shown below) to be loaded onto the Arduino in order to function properly. This is only necessary for the components listed in this section! 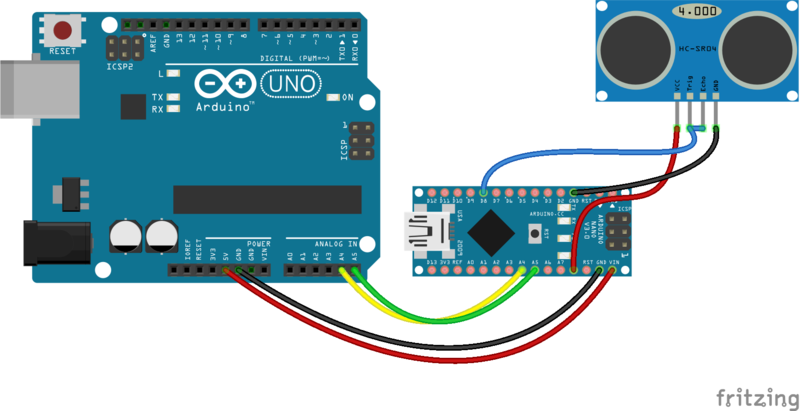 With your arduino plugged in then issue the following instruction, where is the serial port your arduino is plugged into (COM3, /dev/ttyUSB0 etc). The latest firmware will be downloaded and installed upon your board. The final alternative is to copy and paste the source into the Arduino IDE and click the Upload button.